REPORT HAZING – It is a law in most states and failure to do so can result in criminal charges! | Online Hazing Prevention, Education Course. | Online Hazing Prevention, Education Course. After a few hazing deaths in the last couple of years, many states have made reporting hazing a law. Failure to report any act of hazing a student witnesses can result in criminal charges in these states. Many colleges and universities also require students to report any hazing actions they see. If students see hazing activity or someone is in danger call 911. When hazing is not putting anyone in immediate danger or you suspect any form of hazing activities you should contact your campus police or the local police. For students who are part of an organization report any incidents to your organizations’ headquarters as well. Do all you can to prevent hazing. 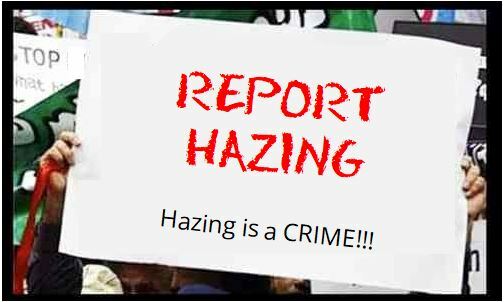 Be aware and report hazing. Hazing is a crime! by Doral Andersson for No2Hazing­™ at E-Concepts, Inc.